Through a rich curriculum that emphasizes critical thinking and collaboration, coupled with access to a diverse community of thinkers and learners, NSU University School is redefining Junior Kindergarten through grade 12, private school education. Teachers, administrators, and peers work with students to ensure personal and academic success. Our curriculum challenges students to continually draw connections between what they learn and real-world experiences – their own and others’. USchool students are also taught to take personal responsibility for their own education through exhibiting a strong work ethic and the willingness to seek help when needed. Inspired by dedicated teachers and motivated by talented peers, USchool students are bold leaders who understand the power of learning. From intellectual development to unparalleled college preparation, students are given the tools to succeed in the classroom and in life. The Junior Kindergarten and Kindergarten program at NSU University School is designed to set the stage for a life-long love of learning and provide the youngest students with a strategic advantage as they begin their educational journey. This one-of-a-kind program offers a student-centered, personalized, and caring environment where young minds can flourish and grow, and where students’ individual needs come first. Passionate and well-qualified educators capitalize on an innovative classroom design and exceptional resources to facilitate collaboration, active learning, and student-drive inquiry. Through the design of interdisciplinary thematic units of study, teachers in NSU University School's Early Education Center empower students' curiosity, intellectual competencies, and physical growth. In the Early Education classrooms and throughout the Lower School, children feel safe, with a sense of belonging and part of a bigger whole. Additionally, the school works to ensure that each student’s school experience is joyful and engaging. Venture into the hallways of NSU University School's Lower School and you will witness children who are joyfully engaged in learning, whether in the classrooms, the hallways, or the outdoors. In addition to emphasizing proficiency in reading, writing, and math, our Lower School curriculum focuses on world languages, social studies, science and innovation, physical education, and character development. Music and visual arts are also an integral component of our curriculum as they help to develop creativity, open-ended thinking, and cooperation. We know that children are naturally curious, and our Lower School educational team cultivates each child’s curiosity and imagination, inspiring a love of learning. The Lower School curriculum is research-based, meeting children at their academic level of readiness. We guide our students to take risks, stretch themselves, and become critical thinkers, preparing them to meet and surmount high academic standards. We also know that children learn best when they are given hands-on activities, which can take many forms. In the innovation lab, students build working robots out of technology scraps. To learn about supply and demand and sales and profits, fourth grade students sell gently used toys to raise money for a non-profit organization. 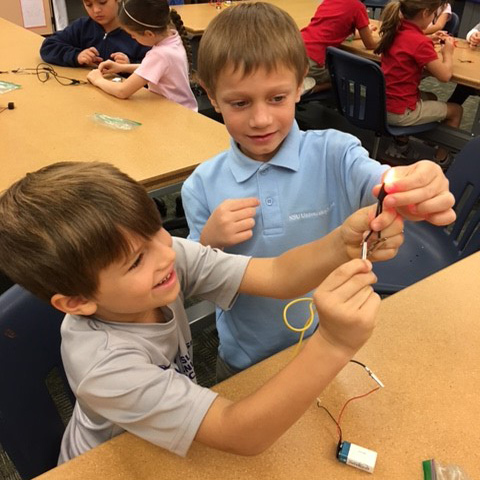 Our youngest students are often the source of the biggest ideas at USchool. Our goal is to ignite learners’ minds in limitless ways. Happily, here in NSU University School’s Middle School, you will not find quiet hallways and silent classrooms. Instead, you will find classrooms, hallways, art spaces, sports fields, science labs, and the stage all bustling with student activity, the exchange of ideas, and students doing what they do best in these middle school years; learning by doing, experimenting, and communicating. Our cutting-edge academic program empowers students to pursue knowledge, big ideas, and questions. Dedicated faculty use a variety of instructional strategies to foster curiosity, exploration, and creativity. Harkness discussions take place regularly in English and social studies classes while the Modeling Method is used to engage students in science and other academic areas. NSU University School teachers understand that every child learns in his or her own way, so they continually seek to differentiatie instruction in order to reach every learner. They know that a "one size fits all" education never really fits. Technology is integrated across the curriculum, and programs such as digital photography, video production, computer science, and robotics offer students more focused opportunities to develop specific technological proficiencies. During Middle School, we encourage our students to maintain their curiosity and creativity while stretching their self-confidence and self-advocacy. Students take the time to explore new electives, try interscholastic sports, and perform on or behind the stage for one of our unbelievable theatrical performances. These new opportunities help to broaden their horizons and help them discover their passion. The Middle School advisory program is an important part of each student's educational experience as it empowers them to learn how to communicate effectively and develop the character and confidence required to make good decisions, engage fully, and act mindfully. We teach our students to reflect on the many ways they interact with the community and strive to help them see different perspectives in all that we do. Our ultimate goal is that students will leave Middle School as critical thinkers, independent and lifelong learners, strong communicators, healthy risk takers, and good global citizens. No two students leave NSU University School’s Upper School having traveled the same path. We encourage each student to rise and meet his or her own standards of excellence. What our students share, in the process, is an experience of intellectual challenge and curiosity. As thinkers and problem solvers, students are asked to stretch beyond their strengths and wrestle with challenging real world problems that do not have easy answers. Upper School students craft individualized academic programs through which they discover their passions as learners and develop their voices as leaders. Our faculty are committed to supporting our students through this discovery process, fostering an experiential, collaborative, and supportive classroom environment in which students shine on intellectual, social, and emotional levels. Working with teachers who are both accomplished in their fields and student-centered in their approach, Upper School students participate enthusiastically in the classroom environment. In any given day, students explore labs, participate in deep and probing discussions, write critically and creatively, refine their thinking, and learn to solve cutting-edge problems. In fact, students engage in conversations you might hear in college seminars. For example, they don’t just learn the process of protein synthesis; they invent their own systems for modeling the process. NSU University School’s connection with Nova Southeastern University, Florida’s largest private university, serves as an added educational benefit for our students. This unique affiliation provides students with exceptional academic opportunities and access to world-class NSU scientists, researchers, and distinguished professors, giving students an advantage as they prepare for college and beyond.